Welcome to my wagon world. It changes daily and here’s what it looked like this week. In the photo below, we’re cruising down a Hoke Country dirt road. 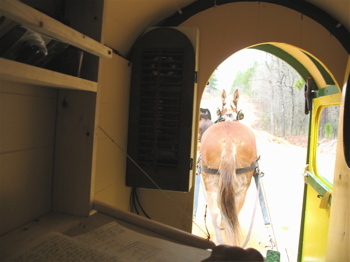 My front door’s open and I trust Polly to hold the course while I rummage around inside the wagon looking for an apple or a notebook or that ever-disappearing pair of worn-out gloves. My desk’s in the folded-down position and you can see my journal under the electrical panel. That dark blotch at the six-o’clock position is my hand on the lines. I’m sitting on my bed. A man can get lost in the moment living like this: mules, friends, dogs and fresh air. And yes, that’s exactly what happened this week on the road. This morning it hit me. Dang! 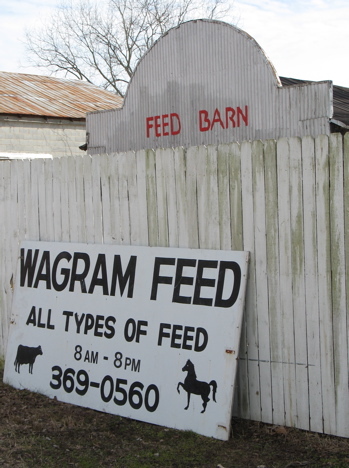 I promised folks who ordered a copy of “Woody and Maggie” or the “65 Days” DVD during my shakedown cruise that I’d mail it to them from Wagram. 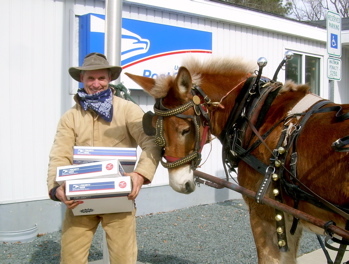 Temperatures dipped into the low twenties last night but this morning, as soon as my fingers were warm enough to harness Polly, I tacked her up and hit the road for the seven-mile run to the Post Office. Things went smoothly until I looked behind the wagon. There, bouncing and leaping as only a three-month old Blue Heeler can, was my buddy Ken’s dog. Luring him close, I hauled him into the wagon so he wouldn’t be hit by a passing car. 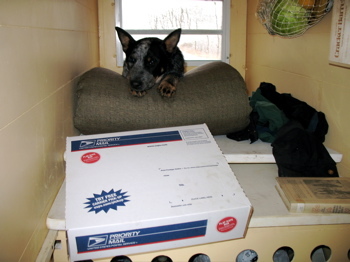 Soon he was curled up in my wagon / office right behind the boxes of Priority Mail books headed for the Post Office. Yes! Now I had a stowaway. And freight guard. i’m supposed to do what with this box…? The trick now was to get into town by noon. I knew Post Offices generally stayed open ‘til twelve on Saturdays so if I hurried I could get my books and DVDs mailed on time. 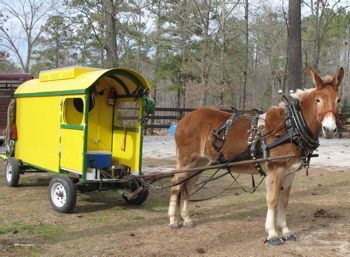 Alternating trotting and walking, Mule Polly and I covered the seven miles into Wagram in just over two hours. We slid into the Wagram Post Office with twenty minutes to spare. Perfect! Here come the books and DVDs you ordered. I lashed Polly to the flagpole and gallantly strode for the Post Office’s front doors. Leaning into them with my winter coveralls, taking care not to spill my armload of Priority Mail boxes, I shouldered them wide. They opened with an echo into an empty Post Office. So…. Norman, Bill, Jenny, Bob, Ken, Mary and Kaye. You’re packages are on the way. Come Monday. In the meantime, mule Polly’s taking me to another place she saw in town. She swears it’s open. The guy that bought me a cup of coffee in Wagram.